I had been putting off blogging because I wanted my next post to be about Rhinebeck, but I’m having issues getting all the pictures uploaded to Flickr at home, so it will have to wait. I did finally get pictures of Starlight and other things I’m working on, though. I think it’s time to do an FO post about Starlight, don’t you? I really like how this sweater turned out, but my one disappointment is that I spent so much on this lovely yarn only to have it pill a ridiculous amount on the first wear. Pre-Ravelry is when I bought this yarn and I didn’t know other knitters that had used this yarn that could tell me how it holds up. 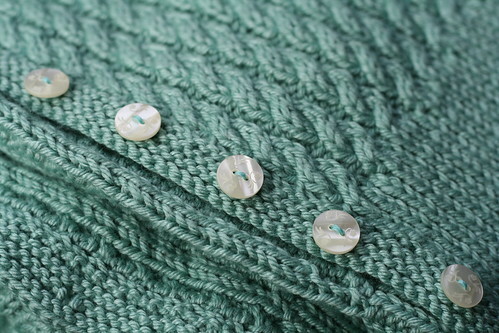 The comments on the yarn in Ravelry say that it pills and doesn’t hold stitch definition well. I think it does hold up the cables quite well (so far), but holy crap this yarn pills A LOT. I wore this sweater at Rhinebeck 2009 and carried my camera bag with me, over my shoulder like a messenger bag. Where the bag sat on my left side is where it pilled the most – I was pulling off clumps of pilling later on. How disappointing! It did pill quite a bit all over on just the first wear, so the next day I was pulling off all the little bits and finding them everywhere. 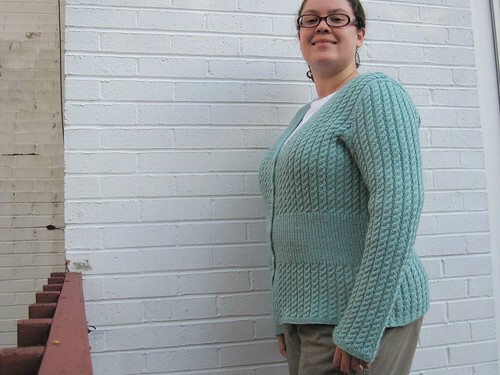 Were I to knit this sweater again, I’d definitely pick a different yarn. It’s really quite disappointing to me to spend so much on this yarn, put a ton of work into this project, only to end up with a sweater that pills so much I’ll probably only wear it on very special occasions. The yarn itself is really nice to work with, very soft, and has a lovely drape, though, just not something I’d use on another sweater. As for the pattern, I really didn’t have any issues with it. I don’t think it would be great for a beginner or someone that doesn’t have some sweater knitting experience because some of the instructions aren’t super clear. The front piece instructions are a great example of this. It give you directions from start to finish for one side, then tells you to “reverse all shaping” for the other side, without giving you much other direction then that. There’s also a lot of “do ____ and at the same time do ____ and at the same time do ____” which can easily get confusing. Starlight is finally done. I still can’t believe it. Yep, it’s done and I love it. The beautiful buttons. I love them! 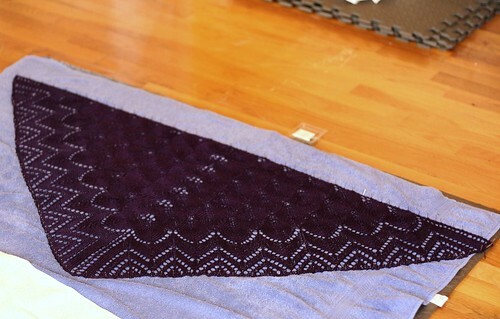 Over the weekend, I blocked the Springtime Bandit shawl. I don’t have any pictures of it post-drying yet, so here it is blocking. I finished up the first Snapdragon and decided that instead of a flip-top, I wanted to do fingerless gloves. I started the second one and just have the thumb part left to knit. I love how soft and warm Malabrigo is. 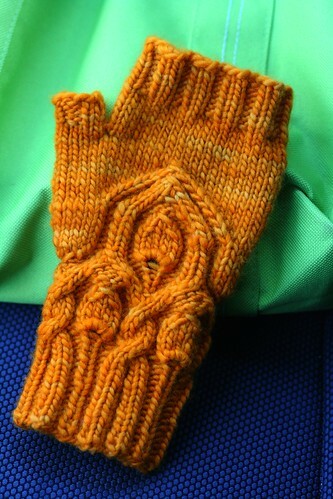 Love the cabled pattern on the gloves, too! Wow, beautiful stuff! I can see why starlight took awhile, that’s a LOT of cabling!